Gabriel brings glad tidings to Mary in the New Testament. And for the past twenty-five years, parents have announced the arrival of their sons sharing the angel’s name. We all know the angel visited Mary, but it wasn’t his first outing. 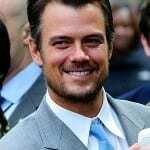 He’s mentioned in the Old Testament, and plays roles in the teachings of Judaism, Islam, and more. Milton placed him at the gates of Paradise. The Bible tells us that a horn will signal the beginning of Armageddon; popular lore names the angel as the horn blower. Cole Porter’s beloved musical Anything Goes included the song “Blow, Gabriel, Blow” in 1934. This makes the name deeply spiritual, and yet, unlike many a Biblical boy name, this one feels generally wearable. Gabe transforms the name from angel to cowboy. While we rarely find boys named just Gabe, a great many boys do prefer the nickname. In 2015, just 88 boys received the nickname version, while nearly 10,800 boys were given the full name. Hannah Montana and Good Luck, Charlie – both Disney Channel series – included characters referred to by the nickname only. The name qualifies as traditional. It has appeared in the US Top 1000 every year since 1880. An Italian saint, who lived in the 1800s and was canonized in 1920. A slave by the name led an uprising in Richmond, Virginia in 1800. He was hanged, but has since been pardoned and honored. Nineteenth century French philosopher Marcel. Nobel-prize winning novelist García Márquez, known for One Hundred Years of Solitude and Love in the Time of Cholera. Plenty of others could be added to the list, too. The name started to catch on in the 1960s, and entered the US Top 100 in 1976. No single reason explains the name’s rise. One possibility: the popularity of Michael, which reached #1 in the 1950s, boosted the similar Gabriel. Instead, we find a steady increase in high profile uses of the name. Sometimes it occurs as a surname – think of Genesis alum Peter, equally successful as a solo artist and advocate for world music. Actors Byrne and later Macht were both early bearers of the name. In 2003, the royal family of Belgium welcomed Prince Gabriel Baudouin Charles Marie, second in line to the throne behind big sister Elisabeth. This name appears in the Top 100 – or even Top Ten – in many a nation. You’ll hear it in France and Spain, Canada and Australia, Sweden and Austria, Chile and Brazil, to name just a few. It’s especially popular in Georgia, thanks to a monk known for his opposition to Communism, now considered a national hero. In the US, the name has ranked in the US Top 100 nearly every year since 1976. It appears in the Top 25 every year, beginning with 2008. Of course, pop culture helps buoy the name, with characters on shows like Heroes and Supernatural. It’s also true that style-sibling Michael remains a Top Ten favorite. 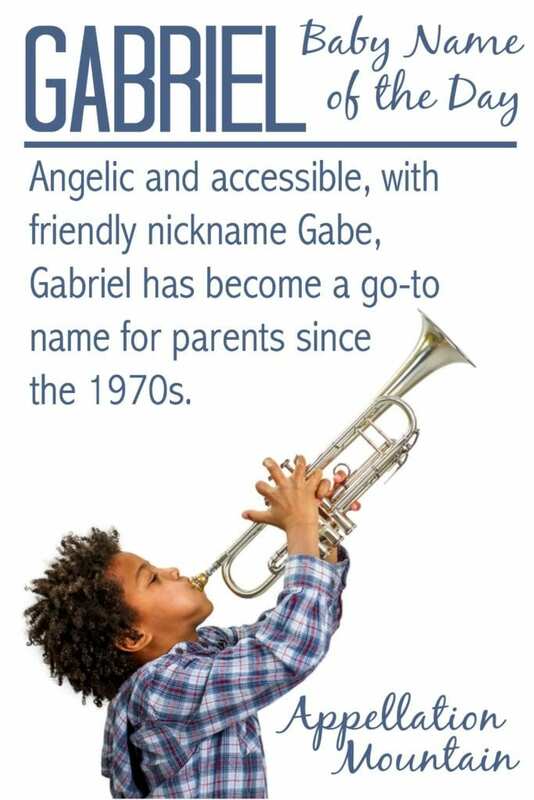 The name mixes a spiritual, serious side with rough and tumble nickname Gabe and a certain jazzy appeal, thanks to all the references to Gabriel’s trumpet. If you’re looking for a modern favorite that feels current without being modern, this name might be one to add to your shortlist. Just know that the name – along with feminine forms – has become a staple choice in recent years. Would you consider Gabriel for a son? This post was published on January 11, 2010. After substantial revision, it was reposted on October 24, 2016. My 4 month old is Gabriel. My favorite thing about the name is it’s connection to the archangel. So far my husband and I call him by his full name while his older siblings tend to call him Gabe. One thing that has surprised me is how many times when reading his name a medical person will say Gabrielle. Gabriel is in my top ten for names. I just imagine a kind-hearted and giving individual any time I hear the name. I get the same feeling when I hear the names Jeremy, Elliot, and Gale. Gabe sounds so laid back as well. Meh. Something about this name Doesn’t sit well with me. I think for a boys name it lacks masculinity. It’s the ree-el sound I think. I love Gabriel…Its in my Top Ten. It used to be number one before it got really popular. My last name starts with Gab-so it could be a way to honor my last name without using my long and hard to spell and pronounce last name as a first name. Panya took the words right out of my mouth. I like Gabriel, I think it’s timeless, but Gabe just rubs me the wrong way. I like Gabriel, but highly dislike Gabe. 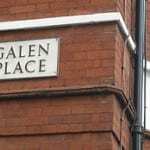 I prefer, and would rather use, Galen, which has a similar feel to me. While I’m not terribly fond of Gabriel, I do for some reason find “Gabe” attractive. Since I’m in Canada, the name reads distinctly French to me (and in French, the nickname would probably be spelt “Gab”). I always assumed parents used Gabriel just to get to Gabe, but I realized the other day that I know at least one who is definitely, absolutely always only Gabriel. I’m not a big fan of Gabriel, but I can’t put my finger on why, exactly. I just always have a not-so-nice person association with the name, but cannot recall ever coming across a Gabriel in real life, so I can’t account for the association. I’m a fan, but not a rabid one. Gabriel’s smooth & charming, but a little too much so for me (Raphael’s my archangel of choice). LOL – Raphael is my archangel of choice! I’ve never really liked Gabriel. Then again, I dislike most long A names for boys. As for Gabe, this nickname seems less rough-and-tumble, and more frou-frou. Consider me not-a-fan. I know two female Gabriels and one male. The girls were born around 2005 ish in Australia, the guy would be in his mid 30’s now. I don’t know what was going on with the female Gabriels, my highschool friend was pregnant and had settled on that, then another pregnant girl we knew from a neighbourig high school called her baby the same thing… I don’t think she stole it because they didn’t know each other, there must have just been something on tv at the time about a female Gabriel. My freind’s kid goes by ‘Gabby’ like Abby with a G. I dunno, putting the stress on the ‘Guh’ sound wrecks it for me. Reminiscent of words agape or aghast. […] ending is fairly common. […] but later ill-fated, Brother Juniper.